The tulip poplar tree, whose Latin name is Liriodendron Tulipifera, is commonly referred to as the tulip popular tree. It actually is a member of the magnolia family and is a fast-growing deciduous tree hardy in zones 5a-9b. It can withstand temperatures as low as minus-20 degrees Fahrenheit. One of the major problems with the tulip poplar tree is its size. It is a a fast-growing tree that can reach up to 120 feet tall, though generally it tops out at 70 feet. It grows so quickly that smaller yards can become overwhelmed in a few seasons, according to the U.S. Department of Agriculture. So considering the amount of space in your yard before you plant a tulip poplar is a very wise idea. In the spring the tulip poplar puts on an amazing display of yellow, tulip-shaped flowers. Its blossoms are one of the reasons the tree is so popular. Those attractive flowers, however, can wreak havoc. Dave's Garden, a popular gardening website, tells us many people are allergic to the pollen of the tulip poplar flowers. So if you or your family are highly prone to allergies, you might want to reconsider planting a tulip poplar. Another side effect of the tulip poplar's abundance of flowers is the wildlife they attract. The Fast-Growing Trees website says that the fragrance of the flowers attracts a wide variety of birds and bees. Allergic reactions to bees are a consideration when planting a tulip poplar. Also, as so many birds are attracted to the tree, having one too close to where you spend time could end up being an inconvenience. Not only bird droppings, but also dive-bombing birds can quickly become a hassle. The USDA reports that in the fall ground squirrels feed on the fruits the tree. In the winter, white-tailed deer feed on the tree's twigs. If the creatures annoy you, you might want to reconsider your choice of tree. Tulip poplar limbs are brittle, the USDA warns. They frequently suffer from wind and storm damage. These falling limbs and twigs can be a hassle to clean up and they can cause significant property damage. 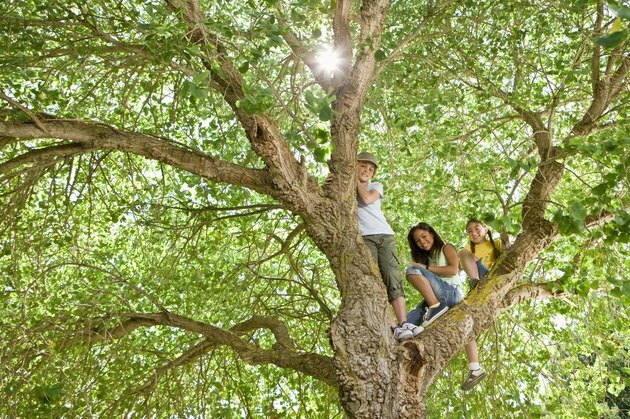 What Are the Different Types of Poplar Trees?